Christmas is almost upon us, and I take the opportunity to provide a list of possible Christmas presents for lawyers and recruitment consultants, as well as shamelessly plug our own Christmas present ideas for solicitors, barristers, paralegals and anyone else. www.cafepress.co.uk - lots of interesting T Shirts and cups and things - including a baby outfit with "my mummys a lawyer" - would anyone really be brave enough to send their child off to nursery in this? This is by far the best present I have seen - a large poster sized version of the Smoke Ball advert - I bet this gets sold to loads of 1st year law students every year.. A bargain at £20.00. (incidentally we dont get any commission for these links!). Also from the same site - 'Non Illegitimi Carborundum' woven diagonally, with lion motifs in the pattern. A tie with the famous motive on - isnt this the motive on the watch sent to Asil Nadir by a Tory MP before he legged it to Northern Cyprus many years ago? The Budget 2009 - any effect on the legal market? • Alcohol taxes to go up 2% from midnight - putting the price of the average pint up 1p (arrghhh). • Growth expected to pick up in 2010, expanding by 1.25%. • Grandparents of working age who care for their grandchildren will see that work count towards their entitlement for the basic state pension. We have looked at this before - it used to be that the grandparents had to be registered with social services, but the only way to get registered was to look after other children from different families which of course most grandparents do not do. We keep hearing reports of this area of law ('get your loan written off'', 'cancel my loan if over £7,000 and under £25,000 and before 2007', 'reduce my debt', 'clear my debt for life' etc.. etc..), being the new potentially big money spinner for a lot of law firms, and have been keeping track of recent developments. A candidate has recently sent us the following feedback from working for one of the operators in this field..."I had been working for x Solicitors who are linked to a claims management firm. As I worked there it became increasingly obvious that there was a lack of independence for us to advise our clients as to the strengths and weaknesses of their claims. Many files did not have claims at all but we were actively discouraged from telling clients upfront that there was no defect in the agreement. Management asked us to advise clients whose files had weak or very poor legal arguments that their files were being sent for further investigation. This delayed refunding clients who had already waited for long periods of time for their files to be addressed. One day in particular a couple of weeks ago I had a client on the phone screaming at me because I felt I could not tell her she was due for a refund as there was no real prospects of success. I told her it was being further reviewed. She screamed 'you're my solicitor why can't you update me'.? She was perfectly correct. Many of the difficulties stem from the fact that the representatives tell customers that agreements can be written off or deemed unenforceable and build up false hopes. Many files come through with very poor legal basis for claims. One argument apparently is being appealed at Court of Appeal later this year. However we were actively encouraged to pursue claims based on a case hopefully being overturned in CA. This was a firm with poor working practices and sullies the image or profile of those firms who operate in a correct and professional way. There are genuine issues under the Consumer Credit Act but they need to be tackled professionally in order to maintain the public's trust." Recently it has been reported that the law firms in the USA are being badly affected by the global credit crisis. There have been reports in the US of the larger law firms making sudden redundancies, but the reports in the various logs and articles in the US legal news indicate that the actual reality is much worse. Apparently there are teams of lawyers being laid off, firms closing down right across the USA and very little work coming in to keep the remaining firms open and trading. The situation is fairly similar in the UK, except probably not as bad as that. In the last few weeks we have seen a large number of candidates register due to recent redundancies, but I have to say that most of the candidates I have seen coming through have been fairly high earning mid-level solicitors, and probably the sort that could be replaced by a firm with somebody more junior, and with a bit of investment, time and training could probably generate similar fee levels to a more senior solicitor on a higher salary. This probably sounds very callous, but it is usually the harsh reality of fee-earning, and also generating a profit from legal services. It will certainly be a similar scenario to when some of the bigger players outside of the profession get their hands on some of the market. Paralegals and junior lawyers will see their salaries increase when they join the big players, but then discover after a while that they are surplus to requirements. This will be something that carries on for quite some time maybe in the legal profession, and I do not envisage the redundancies stopping until the market picks up. I cannot see the market picking up though until well after the summer as there will not be the usual spate of recruitment in May that there usually is. However, one of the problems with this recession is that quite a lot of the actual scenario is down to people talking themselves into a recession and deciding not to do certain things. We have seen a number of firms in recent times tell us they have vacancies and when we find very good candidates for reasonable amounts of money and send them for an interview, the firm decides to put the vacancy on hold, having spent a considerable amount of time and effort trying to recruit and then deciding they just don’t want to anymore when they are halfway through. This unusually has nothing to do with the recession, but more to do with firms looking at the newspapers and thinking that they are exposing themselves to too much risk by considering recruitment at this time. As soon as this changes, I think the market will pick up again. Jonathan Fagan is Managing Director at Ten Percent Legal Recruitment. You can contact Jonathan at cv@ten-percent.co.uk or telephone 0207 1274343. Is there any difference between doing a training contract at a law centre or working for a part of your career at a law centre, than working in a law firm? This question obviously relates to anyone about to progress or currently in a high street legal career as opposed to a city firm or commercial practice. Is there any difference between work you would do at a law centre or the training there or a local or small high street practice? 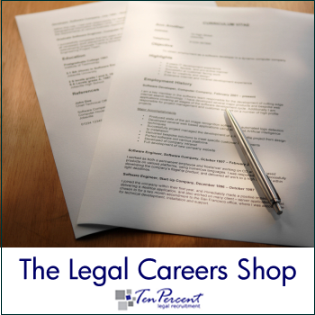 In terms of a career move, you will probably find that if you work in a law centre, you will get greater exposure and depth to a range of legal issues than you would working in a high street practice. It is also possible that the work you would do would be slightly more interesting than the work in a high street practice as law centres are more likely to pick up more interesting cases. However, the types of law you would deal with in a law centre are dramatically different to those you would expect to be covering on a daily basis in a law firm. Firstly, law centres tend to specialise in social welfare work, namely housing, welfare benefits, debts, employment and some family law. High street practices on the other hand tend to avoid social welfare law as much as they can and focus more on the legal aid fields of crime, family and mental health. The other factor to take into consideration is that the high street firms will also do non-legal aid fields so you would expect part of your training contract to include some form of conveyancing, wills and probate, commercial property, company commercial or similar. This will not happen with a law centre training contract or with law centre experience. The other factor to bear in mind is that although both entities are dependent on generating income to keep going, the pressure in a high street firm to bill and bill well is much higher than the pressure in a law centre where there is still an environment that you are there predominantly to help the clients who are coming to see you, whereas in the high street, that is just not possible as they are very dependent on you billing a certain number of hours each day and if that helps the people you are seeing, great, but if not you are still justifying your existence. The final point is the money. Law centres do on the whole pay better salaries to more junior members of staff than high street law firms. High street law firms sometimes think they pay well but in actual fact, don’t put it into context and forget that a salary of £16,000 is very unlikely to buy you any sort of mortgage or lifestyle that you could comfortably live off and then are surprised when somebody hands in their notice after six months. Law centres are more linked to local authority levels (although more senior salaries tend to be quite restrictive) and so have a more reasonable expectation of what you will need to live on and how long you will stop in a post if you are paid that sort of money. In summary, in terms of career progression, you may be better off focusing on high street training contracts as opposed to law centre contracts as the law centre contract is likely to expose you to a much narrower area of law, and will restrict your movement in future years and also your salary level should you decide to move into private practice. Jonathan Fagan is Managing Director of Ten Percent Legal Recruitment and can be contacted at cv@ten-percent.co.uk for any careers advice or recruitment needs. What do I do if my training contract is cancelled? What do I do if my training contract is terminated? This started to happen a few years ago when some crime firms were struggling following new reforms by the Legal Services Commission. When a firm got into difficulties or thought they were about to the first thing they did was to terminate training contracts. Another scenario is when firms in recent times have trainee Solicitors due to start 12 months or 24 months in the future and then realise that their finances are not going to permit it. Training contracts are withdrawn and suddenly someone who had made a firm decision to join one particular firm and turned down others finds that they no longer have any training contracts to choose from at all. The first thing to do is not to panic if this happens to you, quite a lot of the time over the years we have seen Trainee Solicitors who have training contracts terminated walk into another post within a few months. Other firms who are still in business or not struggling financially see the benefit of having someone part of the way through their term as it saves them the time of training them up and also the length of time it will take before they qualify. It is a very stressful time as everyone who is striving to be a Solicitor struggles incessantly to get a training contract and then has to spend two years in what are usually fairly undignified circumstances being bossed about by everybody only to find out halfway through that it could be that they have to start again or find someone else prepared to take them on. If you are informed by your firm that this is likely to happen the first port of call must be the Law Society, as far as I can remember the Law Society are the only ones who can agree to the ending of a training contract. Obviously they are not going to insist that a firm pay you to keep you on if the firm have no money or are about to cease trading, but they may ask for documentary evidence from the firm that this is indeed the case. If your training contract is withdrawn by a firm before you were due to start (and this happened in quite a lot of city firms for example in 2000-2002) then start looking immediately regardless of how the firm who have indicated the withdrawal put it to you. Sometimes it is simply indicated that they may not be able to offer you a contract and they put you on notice. If this happens then I would strongly advise looking around for something else and that you are in a position to have a back-up plan should the first one go pear shaped. Again, speak to the Law Society and also to the Trainee Solicitors group, they’ll be able to give you advice. Jonathan Fagan is Managing Director of Ten-Percent Legal Recruitment and regularly commentates and writes on the state of the legal profession nationally and internationally. You can contact Jonathan at cv@ten-percent.co.uk or telephone 0207 127 4343. Bullying is about power and control and the results can be absolutely devastating. At worst the target will eventually leave to work somewhere less unpleasant; at best they will stay; grit their teeth and get more and more miserable, and less and less productive. It is estimated that workplace bullying affects 1 in 4 people at some point in their career. Bullying is about actions that are deliberate, debilitating and repeated. The target will be bullied until they either leave the organization or is totally subjugated. And then the bully will find their next target. Rule No 1 - never, ever confront a bully. Not in private and not in public.They have been playing their game for a long time; they are skilled at it. All confronting them will achieve, is to actually make your situation even worse. Keep notes – find a quiet place after an incident and jot down the key points of what just happened – what was said, what was threatened and what you said and did in response. This will also help you to calm your nerves. Let someone know what is happening. Do be very careful who you choose to confide in – telling the wrong person can risk them letting the bully know you are making complaints, and then Rule No 1 comes back into play again with even greater force. Start planning your exit – whether that is to another department or to another organization, it really doesn’t matter – the longer you stay the more stressed you will become and the worse the effects will be on your health and your self-esteem. Remember that bullies do not give up. Once they have selected you as a target, they will continue bullying you until you leave or are totally subjugated. Be aware that this isn’t YOUR problem. You are not to blame in any way. It is their problem and the problem of the organization for not recognizing what is happening and for not dealing with the situation, because if the person has been with the organization a long time, you can guarantee that you will not be the first person they have done this to. Laying a complaint about bullying is often one person’s word against another, and if the ‘other’ person is in a management position, the manager seems to be believed more than the employee. This comment was sent through by a reader. I should emphasise that it is a comment - I had problems with my blogspot software and hence have had to post it as a blog entry. The comment does not represent my experience or views. Jonathan Fagan, MD Ten-Percent Legal Recruitment. "Very interesting article on bullying in the workplace. In the legal profession there is, in my experience, a higher proportion of female bullies than in other walks of life. that's not to say more women are bullies than men - just that a larger number of the women in the profession have bullying traits. Perhaps that is down to the nature of the job, perhaps it is because it can be harder for a woman to make her mark and feels she has to adopt certain tactics. I experienced bullying from a female solicitor when I was an articled clerk in London; best thing in that case was to get out - which is what brought me up to Yorkshire (apart from my wife). Thereafter the bullies all tended to be men, not prevalent everywhere, but in firms with high targets, or newly amalgamated, a blame culture semed to bring it on more than anything else. Strangely it was when I looked at being in a quasi-legal workplace that I encountered female bullying again; the employer that I was engaged by had a huge majority of female staff (although a male manager) and from day one I was targeted. Eventually things came to a head, I was unfairly dismissed and pursued a successful case in the tribunal (although settled before hearing - details to be kept under wraps). Although I won my argument it was not the happiest of endings and one that I tend to disguise in my CV. I have since found enjoyable and successful employment "in-house" at a large commercial organisation which works hard to maintain a cordial staff atmosphere despite the current difficult financial conditions. Just goes to show that things can work out well!" Bullying colleagues and employers can be an absolute nightmare for lawyers. The legal profession is rife with the problem as far as we can see (we get a lot of calls to our career coaching service specifically on this subject), particularly as the pressure to achieve targets and billing levels gets higher and higher in difficult economic circumstances. 1. Understand what bullying is and the harm it can do your people and your organization. 2. Don’t confuse strong management with bullying – there is a whole world of difference. 3. Make sure you have a bullying policy in place and make sure that policy is communicated and enforced. 4. Make sure your managers and team leaders are trained in identifying and dealing with bullies. 5. Watch for the signs that a bully is at work – they are actually very obvious. As recruitment consultants, we have spent eight years trying to work out ways to get our clients to pay our invoices in good time, thus ensuring a decent cash flow for our company, but also ensuring that our terms and conditions are adhered to which then benefit the clients as they get generous rebate periods considerations if anything was to go wrong with a placement. In the eight years that the company has been operating, I estimate that on three separate occasions we have had to send bailiffs into firms, and on at least ten occasions we have had to issue proceedings either in the county court or using the small claims procedure. When we issue an invoice, we ask the firm to choose their charity for our charitable donation (Ten Percent donates ten percent of annual profits to a charitable trust which subsequently distributes the money to various charities). We also point out the benefit of payment within the period stipulated in the contract as a firm is then able to take the benefit of our rebate periods. We issue a statement exactly 14 days after a candidate has joined a firm reminding the firm that payment is due within the 21 days to take the benefit of the rebate. We issue another statement exactly 28 days after the invoice has been issued and the candidate has started work advising that the money is payable. We issue a final letter requiring payment after exactly six weeks of the date of the invoice and after the candidate has joined the firm. We send a credit control letter advising that interest and costs have been added in accordance with the statutory position (Late Payment of Commercial Debts Act 1998) setting out a timetable for action which involves giving the date the matter will be passed to external solicitors for them to recover the outstanding debt. This final step takes place seven days after that letter and without further ado we send the debt off to our external solicitors (if not small claims court level) and ask them to proceed for us. We provide the external solicitor with the full case, including all the evidence required to issue proceedings so they can speed up the process and have a brief discussion with our solicitor as to whether a statutory demand issued and bankruptcy proceedings taken or whether we issue proceedings in the county court or using the small claims track. We sit back and let the external solicitors deal with the matter and see how long it takes us to get the money out of our clients! The worst case to date was a central London firm who ignored everything sent to them including telephone calls, emails, faxes and letters, right up until a statutory demand was issued and bankruptcy proceedings started, at which point they disputed the contract, and we ended up in the country court approximately two years after the original invoice had been issued. The firm eventually agreed to a consent order to pay the outstanding invoice plus all costs, by which time the costs were almost the same as invoice, and even then failed to pay within the time stipulated in the consent order. We recovered our money from them, approximately two weeks later I noticed in the Law Society Gazette that the firm had closed down, we had been just in time with our proceedings. I recall as a solicitor in pratice that a lot of firms are very poor at collecting outstanding debt especially from clients where they think there is the potential of further work and are worried about upsetting them. I think this then passes onto the solicitors' suppliers, as the solicitors think that their suppliers consider things in the same way. My take on this is very different. Many years ago I worked for a small company in Leicester, with a senior partner who was a very good businessman and gave me two pieces of advice when I left the company. The first one was that a bird in the hand is worth infinitely more in the bush, and that one should never allow discounts or a lack of payment on the basis of future work promised. I have stuck rigidly to this in my time in business and have found time and again that when I have had to take action against firms to get payment, they have come back to me as clients regardless of how long it has taken to get the money out of them. It’s a very interesting phenomenon because some of these firms have had the full works taken against them including court action, yet they almost respect this and come back to us to use the service again as they can see that not only are we good recruiters, we are cost efficient, fair and run a tight ship.